Spring has sprung, and I think we all know what that means...spring fashion! In addition to trying out all of this season’s major runway trends (i.e. the peplum, bold color, graphic prints, etc. ), I’m also excited for the tie-front blouse. While the tie-front blouse/knotted oxford shirt is currently my obsession, I assure you it wasn’t always that way. Despite having a closet full of button-down shirts, I only recently began to take notice of them. As preppy and classic as oxford shirts can be, the fact is, they’re simply too masculine and structured for my taste. Add in a chic knot or bow, however, and it’s a completely different story! Upon seeing the cover (and inside spread) of J.Crew’s March 2012 catalog, I had a change of heart. Paired with a stunning green maxi skirt was the shirt of my dreams. Besides the fact that it was in a mesmerizing shade of orange, it also came complete with a knotted bow! Since then I’ve scoured my closet for every oxford/button-down shirt and blouse that I own in hopes of replicating this effortlessly chic look. If you’re like me and want to test-drive a new style, then here are three outfits to spur some inspiration! And so, we begin with the look that inspired my article. Spring is all about pastel hues, long airy skirts and lightweight shirts. That being said, why not revamp your old button-down shirts by tying the ends into a bow or knot? It’s a simple and chic way to turn any drab ensemble into something fresh and exciting! The peach shirt above from Anthropologie looks lovely paired with a teal maxi skirt and just the right accessories. If you’re one to normally stay away from color, I strongly recommend giving it another chance! One Ultra-Feminine Blouse, Two Ways. If your style is ultra-feminine, odds are you already own a silk blouse (or two!). Instead of simply tucking your blouse into a high-waisted skirt or shorts, now’s the perfect time to tie it into a bow! With the weather warming up, there’s no time like the present to show off your midriff. You don’t have to be a girly-girl to pull off a tie-front blouse. For a casual ensemble, try pairing it with cuffed skinny leg jeans. On a hot day, wear it with a pair of pristine white shorts. Last, but certainly not least, style it with a skirt! As you can see above, there’s nothing more lovely than a pastel pink blouse and an oh-so-pretty floral skirt. For a girly-meets-edgy look, opt for a short leather skirt and strappy sandals. Gingham, Plaid, Pinstripe, Oh My! Along with spring comes unpredictable weather. One day it’s warm enough to wear your cutest sundress, the next it’s raining and you’re pulling out the raingear. As anxious as you may be for the hot days of summer, they will be here soon enough! When planning your next warm weather outfit, opt for a crisp button-down shirt in a plaid, gingham or pinstripe print. If you don’t own a sleeveless or short-sleeve shirt, then simply roll up the sleeves of a regular button-down shirt. How cute is Lucy Laucht (pictured above)? For a fun-in-the-city style similar to Lucy’s, stick with classic pieces. A white pleat skirt, gingham button-down shirt and ladylike watch will give you the timeless and classic look you so desire. 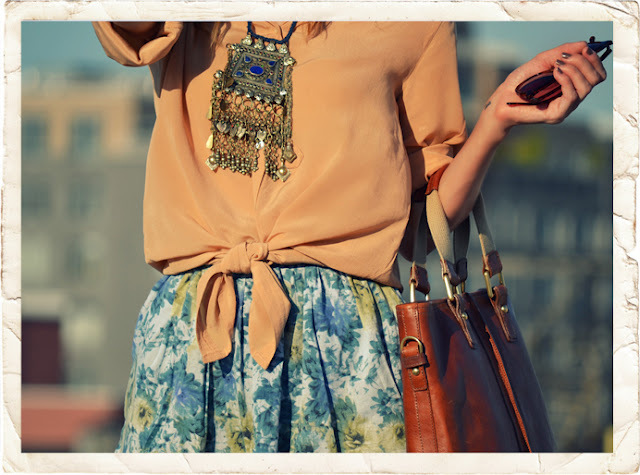 Add in a skinny red belt, vintage messenger bag and cool leather sandals for a foolproof ensemble. Sometimes potential fashion trends are right in front of your eyes, you just don’t realize it. A simple knot or bow is all it takes to add a new “twist” to your wardrobe – try one today! Three Blouses to Invest In!